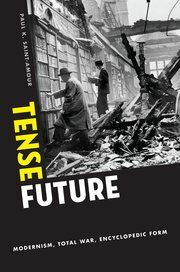 Professor Paul K. Saint-Amour's new book, Tense Future: Modernism, Total War, Encyclopedic Form is now available from Oxford UP. Congratulations Professor Saint-Amour! Paul K. Saint-Amour is Associate Professor of English at the University of Pennsylvania. He is the author of The Copywrights: Intellectual Property and the Literary Imagination, winner of the MLA Prize for a First Book, and the editor of Modernism and Copyright. With Jessica Berman he edits the Modernist Latitudes book series at Columbia University Press. "We know that trauma can leave syndromes in its wake. But can the anticipation of violence be a form of violence as well? Tense Future argues that it can--that twentieth-century war technologies and practices, particularly the aerial bombing of population centers, introduced non-combatants to a coercive and traumatizing expectation. During wartime, civilians braced for the next raid; during peacetime they braced for the next war. The pre-traumatic stress they experienced permeates the century's public debates and cultural works. In a series of groundbreaking readings, Saint-Amour illustrates how air war prophets theorized the wounding power of anticipation, how archive theory changed course in war's shadow, and how speculative fiction conjured visions of a civilizational collapse that would end literacy itself. And in this book's central chapters, he shows us how Ford Madox Ford, Robert Musil, James Joyce, Virginia Woolf, and other interwar modernist writers faced the memory of one war and the prospect of another, some by pitting their fictions' encyclopedic scale and formal turbulence against total war, others by conceding war's inevitability while refusing to long for a politically regressive peace. Total war: a conflict that exempts no one, disregarding any difference between soldier and civilian. Tense Future forever alters our understanding of the concept of total war by tracing its emergence during the First World War, its incubation in air power theory between the wars, and above all its profound partiality. For total war, during most of the twentieth century, meant conflict between imperial nation states; it did not include the violence those states routinely visited on colonial subjects during peacetime. Tacking back and forth between metropole and colony, between world war and police action, Saint-Amour describes the interwar refashioning of a world system of violence-production, one that remains largely intact in our own moment of perpetual interwar."